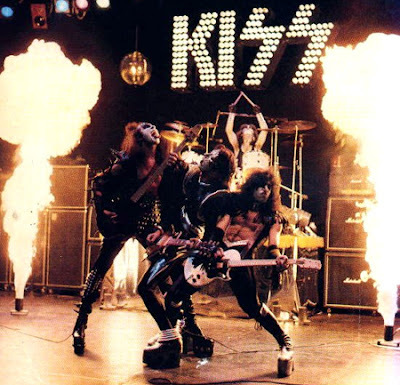 Let me preface this entry with a confession… I’m sure most of already know… I’m a KISS geek. I have been since I was a kid growing up during their magical reign of the 1970’s. I stuck with them while the herd thinned out during the early 80’s. KISS went through many guitarists during that period, but was able to hold on to drummer Eric Carr. Then they rebounded around 1985 during their ‘Animalize’ album and the herd gathered once again. It didn’t last long… KISS became crappy during the years after the ‘Asylum’ album until they released the very good ‘Revenge’ album. And I waited long and hard until they released ‘Carnival Of Souls : The Final Sessions’. That album was influenced by the 90’s era of alternative rock and they wrote some songs that actually meant something. The ‘MTV Unplugged’ album is a must have for anyone that doesn’t know that much about KISS. It strips them down and shows everyone that they are in fact good musicians and songwriters. Not a bunch of clowns who spit blood, breathe fire, and gather much of your hard-earned cash. That MTV appearance with Peter and Ace rejoining them led to their reunion tour. Man, oh man… Was I excited about that! Then after they made their money and decided to tour a second time… Ace and Peter fell by the wayside. They pulled in Eric Singer and Tommy Thayer. I didn’t like the fact that KISS were touring in full makeup with Eric as the “Catman” and Tommy as “Space Ace”. Even though it felt sacrilegious, I still went to see them live several times. I have many of their “collectable” items, but I sort of leveled off from that. I can now go without owning every item they put out with the exception being recorded music. I MUST have the CD’s. And here lately, KISS keep popping up in my dreams… I cannot explain it. Various friends have been with me in these dreams. And in my dreams, those concerts have been of an intimate nature. One particular and vivid dream, KISS were playing a small hall where the monstrous stage took up half of the place. The crowd was so small and up close, Paul Stanley stalked our particular side of the auditorium kissing the ladies and handing the guys (including me) a guitar pick. I’m just not getting why I’m having these dreams. Am I subconsciously longing for another KISS show? Am I subconsciously waiting for another CD? Is it because I’m excited about the upcoming release of KISSology Volume 2? Does it expose my possible sad and geeky state of affairs? But one thing is for sure… My nephew Preston and niece Chloe wants to see them live. They’ve actually seen some of their concerts that I have on DVD and they LOVE them. I suppose one day that one of them will inherit my collection. And tomorrow, I will tell you about the time I passed up the opportunity to meet KISS. How I birthed a sprog who isn't a total Pettyhead is beyond me. Bebo... A crappy "hits" collection is NOT enough. I'm sorry, but he NEEDS KISS 'Alive'. It's the only way to start him off right. To put KISS 'Alive' in perspective... Think of it as a nutritional breakfast to start off his KISS day. I thank you for introducing Chloe to the "singing man who spits blood". You must take into account that Chloe was 3 yrs. old at the time. If you are bleeding she will ask to look. Nothing seems to scare her, as far as blood or bleeding goes. I am thinking this is because of the "blood" that Gene Simmons spits. I am hoping that either she becomes a doctor of some sort or out grows this desire to view blood. However, I encourage you to allow her to inherit you at least half of your collection. I haven't figured it out yet, but for some reason Chloe is just in awe of Uncle Gene.